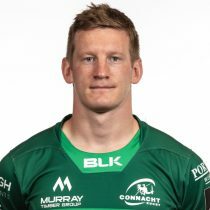 Griffin was born in Barna, Galway and was educated at Colaiste Iognáid, he went on to become a two-time winner of the Connacht Schools Senior Cup. The dynamic centre has represented Ireland U20s and Emerging Ireland over the years. The Galway Corinthians man made his name with Connacht making 71 appearances between 2011 & 2014. Griffin went onto join London Irish in 2014 and enjoyed a two season stint across the pond in the Premiership, making 24 appearances and scoring 1 try. In 2016, Griffin decided to rejoin Connacht and was named at 13 to face Glasgow in their PRO12 opener for his second Connacht debut. Griffin has enjoyed a successful second stint at the Province making over 20 PRO12/14 appearances in two seasons and has been included in the squad ahead of the 2018/19 season.